There are some things you can whip up in the kitchen that give you such an air of smugness. You know, the foodstuffs that you'll absentmindedly drop into conversation just to impress people. Homemade pasta. Macarons. Profiteroles. Tricky things that were invented just so you could show off. And there are some that, luckily, are so mind-numbingly easy to prepare that you really are onto a winner. Homemade butter is one such thing. Imagine casually offering some bread to some house guests, and then handing them over a pat of butter. "Oh, this?" you say. "I just churned it this morning"
And you sound all at once mystical, accomplished and innocently pilgrim-like. Bear in mind, you do have to drop the word churned in there. Otherwise people will think you just mushed some shop bought butter in with some herbs. You want them to think you've slaved a little. But the truth is, it really is as simple as switching on a food mixer, and watching it whizz around. I used a recipe from Darina Allen, who I would deem the expert in such matters. I didn't make it in the quantities she suggested - I just used a small carton of Connaught Gold cream that you can pick up anywhere. I wanted to make a wild garlic butter, because the season is really almost over, and the idea seemed too lovely to resist. Outside of the season, I would use parsley and a clove of garlic. I put a big pat on a steak, which is one of my biggest vices. It's a rarity for me to have a steak without garlic butter dripping all over it. I blame Paris, though in reality it all stems back to university, where we would occasionally visit Cafe Rouge in Windsor for what we thought was a luxurious dinner. Cafe Rouge was the height of Bohemia and elegance to us, back then. We'd order the minute steak, which arrived with a melting pat of strong garlic and parsley butter atop. It was glorious, and I've had it in various spots all over the world since. 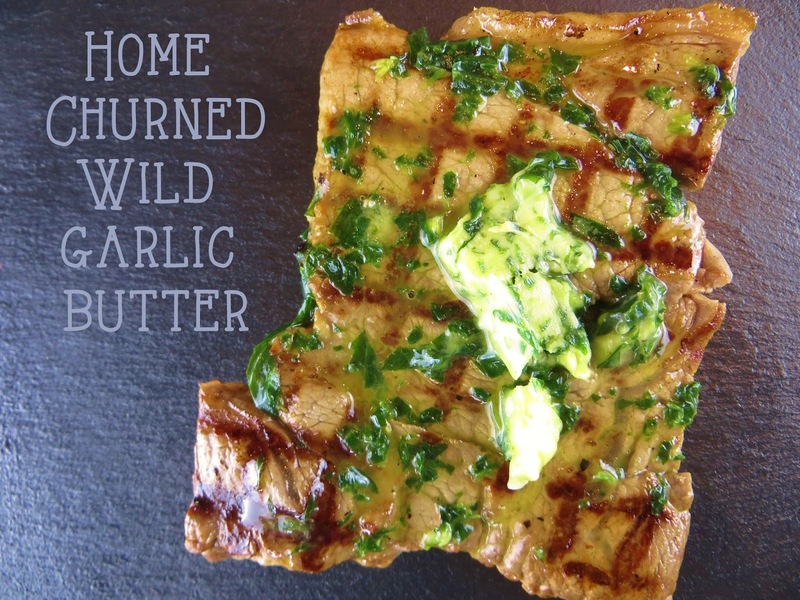 If you can't be bothered making your own butter, then you can of course just moosh chopped wild garlic into softened butter, or even a clove of very finely chopped fresh garlic and some chopped parsley. You can read Darina Allen's recipe here, which is a lot better than my adaptation. Mine is a little lazy. 1. Put your cream into a mixing bowl and whisk at a medium speed. The cream will thicken, then thicken some more, then split. When it curdles into little yellow blobs, you're almost there. But keep whisking - you want the buttermilk to separate. When this happens, whisk for just a few seconds more. See what happens in the GIF below. 3. Fill a bowl with very cold water and ice, and plonk your butter in. Rinse all of the cloudy buttermilk off of it. Make sure you keep your hands cold, or you'll melt the butter. Work quickly. 4. Squeeze the remaining buttermilk off of the butter, rinsing as you go. Repeat until the water is clear. 5. In a bowl, use a fork to blend the wild garlic with the butter and a teaspoon of salt. 6. Put some cling film down on a smooth, clean surface, and pop your butter in the middle. Roll the cling film over, and then roll the butter into a fat sausage, before wrapping it tightly in the film. A prettier and more traditional way is to use greaseproof paper, but I never, ever have this in the house. 7. Put into the fridge. When you're ready to use, slice a disk off and put it on your steak just before serving. Or eat it however you wish!